Ascot Diamonds is one of the highest reviewed jewelers in the United States with hundreds of “5-Star” online reviews. Our mission is to provide impeccable service, excellence and competitive prices in an engaging, dignified atmosphere. From the first time I walked into the business and met Tim to the time I had the ring in hand, I had a great experience at Ascot. Tim was incredibly helpful and informative. He went above and beyond to find the exact ring that my now fiancee had her eye on, despite her seeing it at another jewelry store. I’d recommend Ascot and in particular ask for Tim to help you find the perfect ring. One word to describe my buying experience at Ascot Diamonds – FLAWLESS! Living in Kansas City, I was nervous working with someone I’d never met in putting together the details on my fiancé’s engagement ring. Maurice was kind, patient, and meticulous about covering every detail necessary in making this gorgeous engagement ring. When it was all said and done, Ascot Diamonds crafted the most beautiful ring I’ve ever seen. She gets compliments almost daily. I will absolutely say “YES” to Ascot Diamonds for any future jewelry!!! My fiancé and I worked with Tim to design my engagement ring and had a phenomenal experience. I only met with Tim and my fiancée once to pick out the band and look at diamond options, and he was so helpful in explaining the differences between the properties and grading systems. We were interested in a lab grown diamond (which we could only find at Ascot in this area) and he showed us multiple lab grown diamonds to compare to traditional diamonds so we could eventually determine we wanted the lab grown to get a larger diamond for a lesser price. He was very patient and met with us for nearly 90 minutes on a Friday evening. He was in constant contact, so I’ve heard, with my then-boyfriend about the process and details and our budget. He never tried to upsell anything and worked within our budget guidelines producing for us an extremely superior product that has wowed everyone who has seen it. We will be returning to him to design our wedding bands for our ceremony in the summer, and I’d highly recommend Ascot Diamonds for any type of jewelry need. Absolutely fantastic experience with Tim at Ascot Diamonds. I set up an appointment with Tim to browse and potentially purchase an engagement ring for my now fiancé. I immediately felt at ease with Tim as he walked us through the process and provided us with honest, caring input. My fiancé found a design online that particularly caught her eye and Ascot was able to produce a custom ring that exceeded our expectations! I would unequivocally recommend Ascot Diamonds if you’re looking for superb customer service and top quality diamonds. I would definitely recommend Ascot to anyone looking for an engagement ring. I found Ascot online and was not sure what to expect when I arrived. Instead of the typical overwhelming jewelry store experience it was a very relaxed and professional one-on-one. Tim was extremely helpful and patient throughout the entire process. Not once did he ever try to pressure me or up-sell me, which made me feel much more comfortable. He took the time to educate me on the different properties of diamonds and the different grading systems. With a loupe in hand we looked at over a dozen diamonds before finding the perfect one. Tim was extremely dedicated to making sure we were satisfied, he even stayed late on a Saturday to make sure that we had the perfect ring within my budget. They did not have the setting in-stock but Tim was able to overnight the setting from their Atlanta office and had the diamond set and ready for pickup just a few days later. We could not be happier with the ring and my fiancé continues to receive compliments almost daily. We will definitely be going back to Ascot for her wedding band and for future purchases. Maurice and his wife are absolutely incredible. Amazing experience all around. Maurice is a true expert and professional. From the moment that we met him, I knew that I was going to buy my fiancé’s engagement ring at Ascot Diamonds. Within 24 hours of our first visit, I was contacting him again to set up additional visits. He was easy to contact and made every effort to find exactly what I wanted for the woman of my dreams. When I arrived to look at a hand-picked selection of diamonds, the size, price and details of each was spot-on. Additionally, Maurice made every effort to design and create a custom engagement band that was EXACTLY what I had asked for. Our engagement was the very best day of my life and the ring was a very big part of that experience. It would not have gone as amazing, had we not met Maurice and his wife. My fiancé and I are incredibly picky people and Maurice nailed our style and fulfilled every expectation. When we received the ring back after sizing, Maurice was very quick to catch a small imperfection (of no fault of his) and he immediately had an entirely new ring created for us at no added cost. Could not have asked for more incredible customer service and retention to detail. After sifting through several jewelers, there is no doubt that Ascot Diamonds is the best and is the only one I would recommend to others. My husband and I had a great experience at Ascot Diamonds! Tim Birch helped us find exactly what we were looking for in wedding bands. We were able to take our time, discuss pros and cons of different metals, price out options, and then walk away and think about it without any pressure. They even cleaned and tightened my heirloom engagement ring that wasn’t even purchased there. It is hard to find a jeweler you feel you can trust, but we felt we could trust Tim at Ascot. Our rings are beautiful and fairly priced, and we feel like we can easily go back to Tim with any repairs or cleanings. I recommend Ascot to anyone looking for rings! I walked in without an appointment on a snow day without much of an idea of what I was looking for. Tim Birch welcomed me in, walked me through the basics, keyed me in on some specifics that I wasn’t aware of and even let me in on a few industry secrets. After showing me a few stones and settings, Tim instantly knew not only what I was looking for, but understood me and my girlfriend’s personality types. I shopped around a bit, but always checked back with Tim to get the scoop. After visiting two other jewelers and shopping online, nobody provided the level of service or value that I got from Tim. He scoured the market and found me a stone through his connection in India that was absolutely perfect and fit within my budget. He got it delivered in time, worked the price on the setting with the designer to fit within budget and had it custom built and designed before I left on my trip. I will absolutely be referring family and friends to Tim, and anyone reading this review would be crazy to buy anywhere else! Great Service, Great Selection, Why Go Anywhere Else? Tim Birch at Ascot was great to work with. He guided us through buying my wife’s wedding band, and my own wedding ring. Easygoing, knowledgeable and personable, Tim made the buying experience a piece of cake. We want on the recommendation of another friend who bought rings for his own wedding there. As the grandson of the owners of a small independent jewelry store, I appreciate the professionalism and personality of Ascot’s team. Schedule an appointment and meet with them. You won’t be disappointed. We had the most wonderful experience working with Wyona and Maurice. They listened to every detail of what we wanted in an engagement ring. I am still amazed at how easy it was to work with them from California. Through email they sent detailed pictures of what the ring designs looked like and we gave feedback. The diamond they found for us fit our budget and far exceeded our expectations. We are very pleased with our purchase and plan on making many others in the future from Ascot Diamonds – wedding bands next! 🙂 Thank you again Ascot team! I can’t say enough about both Ascot diamonds and Alison, who I worked with. I randomly found Ascot through searching online for local jewelers during my hunt for an engagement ring. All I knew was that I did not want to go to a large, commercial jewelery store and be bombarded with sales reps and tacky looking pieces. Once I made an appointment with Alison at Ascot, I never looked back and I could not be happier. With the help of Alison and through several visits, we selected an amazing ring at a great price. The quality of the stone is incredible and my fiancee gets compliments everywhere. She absolutely loves the ring and had zero part in selecting it. There is no doubt looking at the ring that it is of high quality and it seems that is the norm at Ascot. Don’t be intimidated by the appointment-based meetings and the “high end” feel you get while being there. You really can find great deals here and have a wide variety of diamonds to choose from. I highly recommend both Ascot diamonds and Alison. Ascot diamonds is the only dealer worth working with….Maurice was extremely knowledgeable and committed to listening to what was important to me. He shows integrity and professionalism to his clients and only tells the facts. I spent days visiting 5 other major diamond dealers in Dallas but realized their priority was to “wow” you with a fancy showroom vs true quality. Tim at the Ascot Diamonds in Arlington, VA was great to work with. I came in with a general idea of what I wanted for an engagement ring, but had no idea how to pick out a diamond. Tim spent ~2 hours explaining all the in’s and out’s of how to pick a diamond and was able to show me examples of different types of diamonds. I had no idea there were so many things to look for. He didn’t pressure me to make a decision and even told me things to look out for if I went somewhere else. When I knew enough about picking the diamonds I went back to Ascot and looked at a few options they had in their inventory. They didn’t have exactly what I was looking for so Tim ordered 2 more diamonds that were closer to what I wanted. He really went above and beyond to get me what I wanted. I ended up picking one of the 2 he ordered for me and it worked out great! I will definitely be recommending Ascot to anyone I know looking to buy an engagement ring. Ascot Diamonds and Tim were excellent. I found this place through these reviews and was not disappointed. I managed to sort through all the factors when buying an engagement ring with Tim and finally settled on the one that I proposed with. My now fiancée, loves the ring and she can’t stop looking at it. I highly recommend this diamond broker to anyone looking for a special piece of jewelry. 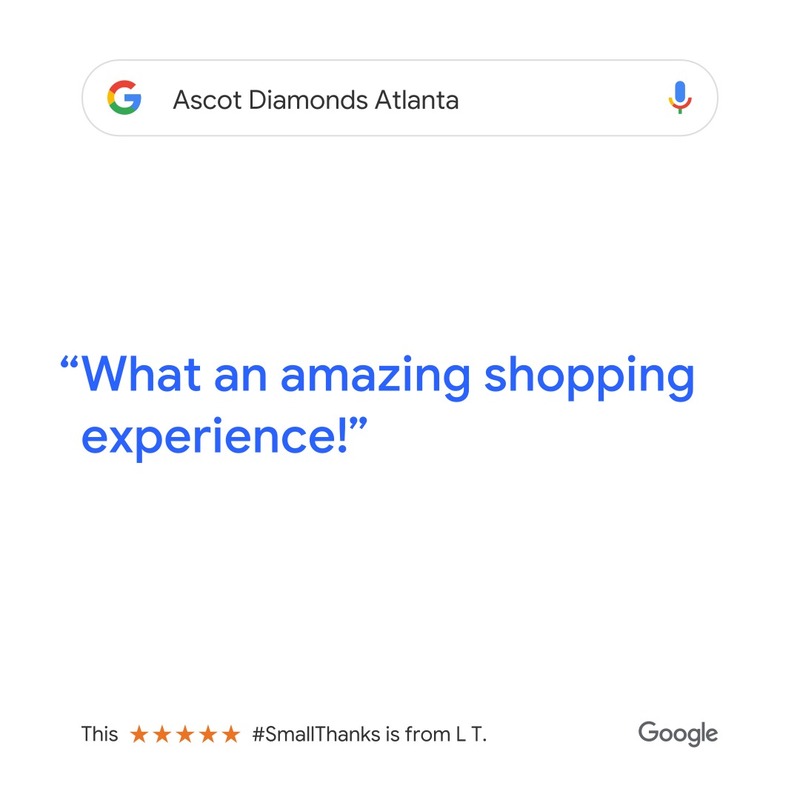 If you’re reading this review, you owe it to yourself to make an appointment with Tim and give Ascot Diamonds a try. If you do I’m almost certain you will end up purchasing your engagement ring through them. A friend purchased his fiancee’s engagement ring from Ascot and recommended them to me. I first met with Tim in October 2015 and Ascot was the first jewelry store I visited. Tim spent a while with me talking to me and my fiancee’s sister about diamonds, the 4 C’s, ring style, precious metals and all the other elements of designing a ring. He was incredibly patient and really made things easy to understand. He then started pulling out example rings and asking me about my fiancee’s taste in jewelry. It wasn’t until this point, after talking to me for close to an hour, that he asked about my budget. It was clear to me that no matter if you’re spending $1,000 or over $30,000, Tim and Ascot treat all their customers with respect, regardless of how much they plan to spend. What is more, through the entire process Tim respected my budget and never tried to push me into spending more money than I was comfortable with. At other jewelry stores I kept getting pressured to buy a ring I couldn’t afford. Other stores also tried to get me to pay a “finders fee” in order for them to find diamonds to show me. Tim showed me at least a dozen diamonds that Ascot had on site and never requested any type of fee. After visiting more jewelry stores, I ended up coming back to Tim in November 2015 and ordering a ring through Ascot. They helped me modify an existing ring design so it would perfectly suit my fiancee’s taste. As the ring was being made, Tim kept in touch, giving me updates throughout the process. The ring was finished ahead of schedule, and I proposed to my fiancee in January on a beach in Aruba. She absolutely loves her ring, and I know I have my fiancee’s sister, Tim, and the rest of the folks at Ascot diamonds to thank for that. As if getting a great ring in my budget wasn’t good enough, I had the ring appraised for my insurance and it appraised for significantly more than I paid for it. So, to summarize, Ascot Diamond has a wide selection of diamonds on site to select from, Tim and his colleagues treat all their customers with respect, and they will work hard to get you the best ring for the best price. I never felt compelled to leave an online review for anything, but I made a Yelp account specifically to write this review of Ascot. I will continue to recommend them to my friends and will be returning to them to get my fiancee’s wedding ring. Thanks for everything! I stumbled across Ascot Diamonds during my search for an engagement ring. Once I stepped in and started working with Marlene, I knew I was at the right place. No high pressure sales tactics. Just genuine interest in helping me make the right decision, and the highest quality products I had seen among all the retail stores I visited. The quality of the diamond and setting are exceptional. My wife continues to get compliments on her ring 3 years later. The customer service does not stop once you make the purchase. The folks at Ascot have been extremely caring and helpful in all the minor size adjustments and cleanings they that are required as time goes on. I have recommended Ascot to a few of my friends for various products, and they have all had a similar experience. My experience purchasing an engagement ring at Ascot was absolutely excellent in every possible way. From the first consultation to the finished product, Tim and the team at Ascot were professional, engaging, diligent, and highly customer focused. Tim graciously took the time to provide a comprehensive overview of diamonds and engagement bands, and worked with me to determine the exact specifications for my custom engagement ring. Discussions were never rushed and communication was constant over the period of creating the ring. I am especially thankful for the speed with which they were able to produce the finished ring. I had a tight timeline between the first time I arrived at Ascot and when I was traveling back home to propose. Even within these constraints, Tim was able to find the perfect diamond and obtain the specific band I desired. Overall, the quality of the engagement ring is superb and it is truly beautiful. My fiancé loves the ring and is constantly told by others how magnificent it looks. I can’t thank Tim and the entire Ascot team enough for all of their work. Tim at Ascot Diamonds is exceptional! Besides being extremely patient, informative, knowledgeable, and personable, Tim completely (down to the cent) respected my budget while ensuring that the ring was exactly what my girlfriend had envisioned. We are grateful to have found Tim and Ascot diamonds! Tim is the best! My fiancé and I were referred to him by a friend and we had the absolute best experience working with him. He is patient, thoughtful, honest and overall a great guy to work with. My fiancé enlisted my help with the engagement ring so I didn’t think there could be any surprises but when I saw my ring for the first time, I was floored! It is even more beautiful than I ever could have dreamed! We are so lucky to have found Ascot in our own backyard and recommend it to anyone looking for their dream engagement ring! My experience with Ascot was absolutely stellar. My journey started when my girlfriend (now fiancée) and I were in Ballston and decided to stop into Ascot unannounced to see if they would show us diamonds / engagement ring settings to get a feel for her tastes. Tim gave us his undivided attention the second we walked into the office. For the record – the office is very nice, and while there are a few showcase items on display, the experience does not feel “salesy” or overwhelming. Instead, walking into Ascot feels like you are meeting with a professional organization that deals with high-end clientele seeking a more custom approach to jewelry (very refreshing). I left knowing that Ascot would be getting my business because the experience was informative, professional, and not pushy at all. A few months later I got back to Tim to begin the process. We spent a few weeks searching for the perfect diamond candidates. Once a list of finalists were chosen, Tim arranged to have them on-hand to view in person. From the ones Tim brought down for me to see, I was able to choose one that met all of my expectations, at a very reasonable price. From there we began the ring design consultation. I had a very specific setting in mind, and provided Tim with pictures that his design team could work from. Being a completely custom process, we had a few back and forth critiquing CAD productions until Tim and I were both comfortable that the ring was ready for production. From there the stone was shipped off, and I was given a date that it would be delivered and ready for pick-up. As promised, the ring was delivered on time. After much anticipation, I was finally able to come in and see the ring, and was absolutely stunned by its beauty. The ring exceeded all of my expectations and I couldn’t have been happier with its visual presentation as well as the quality of manufacturing. To make an awesome purchase better, the ring appraised for 40% more than what I paid! Awesome right? A week later I popped the question and she said YES! We have since been overwhelmed with compliments regarding the ring! Definitely coming back for our wedding bands. I have already recommended Ascot to a few friends whom I know are going to be in the market soon. All of the 5 star reviews you are reading are legitimate. You will not be disappointed! Thank you Tim, and Thank you Ascot! Tim and Ascot came highly recommended from a coworker and they met and exceeded the high praise they had already received. Tim and his team gave me a great education on diamonds and made a seemingly daunting process easy and enjoyable. In the end they also went above and beyond to help me get the right stone on a relatively short time frame that my fiancée and everyone who sees it absolutely loves. Tim is amazing!!!!!!!!!!!! I would HIGHLY recommend Tim and Ascot Diamonds to anyone who is shopping for an engagement ring. I walked into Tim’s office several months ago completely overwhelmed by the prospect of shopping for an engagement ring and not knowing where to start. I saw that Tim and Ascot Diamonds had incredible reviews and I figured I would give them a try. I’m so glad I did! Tim was professional, patient, courteous, extremely knowledgeable, and most important of all VERY fair and honest. Tim sat with me through many sessions as we looked at diamonds and rings. He never tried to push me in a particular direction and never tried to rush the process. He was very flexible and always willing to customize a ring to our particular tastes. The final result was incredible!!!! The ring Tim created was beautiful. I proposed to my girlfriend on New Year’s Eve and she said YES!!!!! Everyone she shows her ring to says it’s one of the nicest rings they’ve ever seen! Thanks Tim!!! We will DEFINITELY be returning for our wedding bands! I cannot say enough great things about Ascot and Alison who helped us. I had not heard of them before but we decided to visit based on both online reviews and the unique rings I saw on their web site. We were searching for a 10 year anniversary band. The service was amazing – patient, helpful, creative, and really working to understand my preferences. We selected a ring that we are so happy with. I receive lots of compliments! When we are next in the market for jewelry, we will be going to Alison at Ascot, without a doubt. They are amazing, we felt we had a fair price, and they were very willing to work with me. Give them a try! Tim and his team at Ascot Diamonds are truly as good as they get! We were referred there by a few friends of ours and couldn’t be happier we received this suggestion. This was our first time looking for rings and Tim made the process relaxing, fun and most importantly, comfortable. He sat with us for hours on multiple days explaining different aspects of our ring (who knew there was so much to know about diamonds and different types of gold!) and throughout the entire process was incredibly honest about what looks good and what was right for us. In addition, he was so flexible with appointments – we could go before work, after work, on the weekends … he always made himself available! Aside from being incredibly knowledgeable and professional, Tim was so personable and thoughtful. My fiance and I got engaged a few weeks before Thanksgiving and had inherited a stone, so we went to Tim right away to pick out a ring and I told him from the beginning that it was SO important to me to have the stone in time for when I visit my family for the holiday. And of course, Tim made it happen. Being able to share the ring with my family was so meaningful and special, and it was all made possible by Tim. We’re looking forward to going back to Ascot and visiting Tim for our wedding bands! My husband purchased both my engagement and wedding rings here. Ascot’s definitely exemplifies the highest quality in jewelry/diamonds. We visited several jewelers that didn’t even come close to their standards. They are also very conscious about working/staying within your budget, which I really appreciate. Plus, for their quality, I’m certain you’d be paying much more at other places. Their customer service is also top-notch. We worked with Alison throughout the whole process and she is wonderful. Definitely recommend. I ordered from online a diamond to be put into an engagement ring. I was pricing around settings at a few retailers locally. I visited Ascot because they were one of the few places that would inspect and verify the quality of the diamond I ordered online. Did I mention that they did this for free with no expectation of me? They gave a very thorough and honest opinion of the diamond. Alison was such a pleasure to work with that I checked out their assortment of settings as I did in several other shops. I found one in a catalog that I liked in another shop as well. Ascot was more customer friendly, less expensive (I think due to them doing mostly wholesale), and were able to make modifications to the setting – as in replacing little stones with emeralds and topazes. On top of that, they ordered extra of the stones so that if we ever lost any, they could replace them with exact matches. Oh and did I mention that the replacement of those would be free as well? My fiancée and I were referred to Tim by a colleague and we could not be happier with the suggestion. In our first appointment (first time looking for rings) Tim sat with us for a hour just explaining the 4 Cs, differences in white gold vs. platinum, bow ties patterns, and fluorescence. He is clearly an expert. We also loved how honest he was about what would look good, what prices we could expect, etc. We found out later that during our first meeting, the store had been officially closed for an hour, so we had kept him two hours after closing and he didn’t even mention it. Once we decided on the shape, Tim was able to get a stone that perfectly matched our specifications. At this point, my fiancée was looped out of the process so there could be some element of surprise. Working with Tim to finalize the design was great. He made sure I was extremely happy with the final product and even provided recommendations for ring insurance. We just went back to Tim to pick out our wedding bands. We are short on time and he was extremely flexible fitting us in for an appointment last minute. He remembers so many little details about our relationship, wedding, and honeymoon. He’s such a pleasure to work with! If you work with Tim (or I am sure anyone at Ascot) you will not be disappointed! !